On the last Saturday of October, a full house of diners joined us for a delicious bespoke three-course dinner at the first Blinis Café-Bar Supper Club. Blinis Supper Club was born after repeated requests from our regular diners for evening dining. So now, on a handful of Saturday evenings during the year, we will open our doors to our supper club guest list and serve a dinner menu. 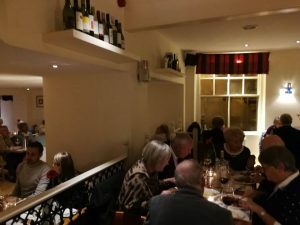 Our inaugural supper club was a great success, and the feedback from our diners was extremely positive. Our supper club guests enjoyed a choice of meat and vegetarian dishes at each course, served with a selection of guest wines. Beetroot cured salmon, heritage beetroots, orange segments, watercress. Ham hock and apple terrine, caramelised apple puree, hazelnut salad. Paprika dusted stone bass, savoy cabbage, shellfish and pancetta bisque. Pan-seared duck breast, cavolo nero, celeriac puree, black cherries, sour cherry jus. Porcini panzerotti with wild mushroom, soy and cream sauce. There was also a selection of delicious desserts to choose from and a cheese board. We’re looking forward to our next supper club which will take place in the new year. We’ll publish the date here and on our Facebook page. 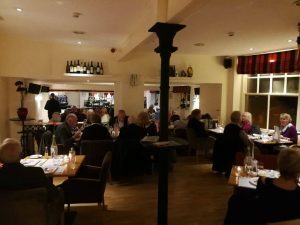 Our supper club evenings are ticket only, and the first event was highly popular. If you’d like to attend the next one, please sign up to our email alert and we’ll notify you when the next date is released.